For some people, supporting socialism means supporting public streets and public schools. That’s not how LaSalle County Tea Party members who rallied in downtown Ottawa Monday see it. Larry Langston of Serena says public streets make capitalism possible. Mary Nevins of Ottawa says public streets and public schools are things a country does to keep things moving. Joni Sorce of Streator says capitalism makes life better, giving people an incentive to improve things. 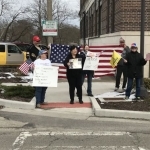 The Tea Party held the “Rally Against Socialism” outside the Central Life Building on the tenth anniversary of the Tea Party movement’s first rally. Local leader Dennis Corbin chose that location because there’s a Congressman’s office inside. He says it was not a protest against Cong. Adam Kinzinger.